So I knew if I wanted to continue doing my cross-country road trips, I needed to get a more reliable car. I mean my 2007 Ford Focus has been great. It has over 250,000 miles on it. With this kind of mileage and the fact that I did break down in the middle of nowhere Iowa, it started to make me nervous taking the car for longer road trips. I knew it wasn’t worth sticking the money into the car to make it reliable enough to take cross-country. I also needed to get the e-brake fixed for it to pass inspection. Due to being a Northern car originally, the undercarriage was pretty rotted out. My plan was to buy a brand new Fiesta and see if I could get the same life as my old Focus. I started looking at local dealerships, and on my way back from the Columbia POE, I saw a billboard for a $13,000 brand new Focus at Bluebonnet Motors. I looked online when I got back and found a bunch of Focuses listed for $11,999. I guess I wasn’t going to get a Fiesta after all! That weekend, I drove to New Bruanfels with the intention of looking at the Focuses. I found out they were selling these on special and there were only a few left. 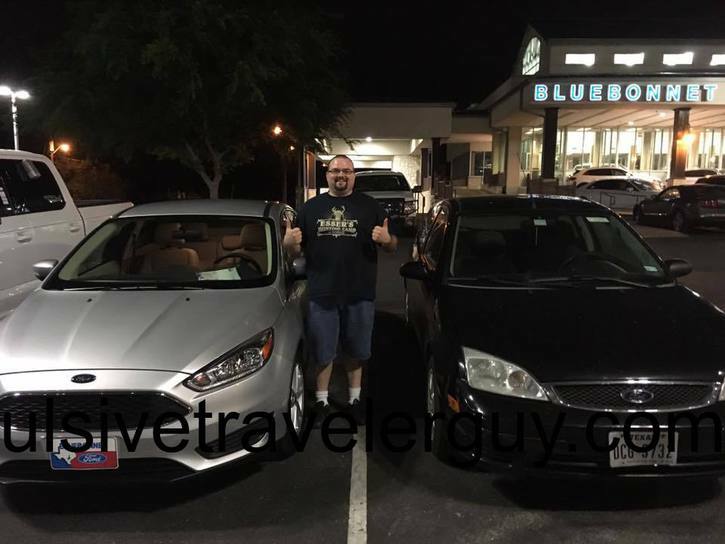 While I had the intention to just look at the cars, I ended up driving off with a new 2017 Focus SE with the 1.0 liter Ecoboost and a 6 speed manual. Now, I was offered $300 for a trade in on the 2007 Focus. They actually told me that’s the highest mileage Focus they had ever seen and was in pretty good shape considering its miles. I left it there for the night and drove off with the new car. I had intended to get the title and sign it over to the dealership on Monday. Well, come to find out, the title I was given at the Wisconsin DMV (I still have it titled in Wisconsin) was basically a photocopy and not a replacement title like I had asked. Basically, I couldn’t sign the car over. Instead of going through the hassle, I decided to keep the 2007 for a local beater. I was going to be moving to a different apartment and this would double the atypical commute I’m used to. By keeping the 2007 Focus, I would be able to keep the stop and go miles off the new Focus and hopefully make it last longer. I had to drive back to Austin to pick up my girlfriend, so I could come back, pick up the old car, and then drive it back to Austin. I also made arrangements to get the e-brake fixed so it would pass inspection. I now have both Focuses in my possession and drive the 2007 back and forth to work and around Austin. The 2017 is kept under covered parking (until I can get a garage I’m waitlisted for) and is used for my long road trips. I know both will get a ton from all the traveling I do. I guess a screwed up title was kind of a blessing in disguise. Now the interesting thing is, I can do a lot of comparisons with my Focuses. They are 10 model years apart (2007 vs. 2017). They are both SE models. They both have manual transmissions, with the 2007 having a 5 speed and the 2017 having a 6 speed. The engines are a bit different with the 2007 having a 2.0L naturally aspirated engine and the 2017 being a 1.0L Ecoboost. In the future, I will write some more blog entries about my Los Dos Focuses doing comparisons between them. I do love these little cars and I guess having 2 is kind of cool!